ADSL bonding is significantly cheaper than a leased line and provides businesses with resilience. Since there is so little published independent information on the real performance of bonded ADSL solutions, we are delighted that we have been able to trial a bonded ADSL service from UK-based Evolving Networks. Here we bring the first part of a series of independent reviews from a comprehensive and extensive trial. In this review, we focus on a (minimum) two-line bonded ADSL configuration, with each line delivering throughputs of about 5 Mbps. In summary, we have been absolutely delighted with the bonded ADSL service from Evolving Networks, which has consistently delivered about 96 to 97% of the combined uplink and downlink throughputs of the two, optimised single connections used. Despite being located a significant distance from our rural exchange, the bonded ADSL service has also delivered very low latency (delay), with pings of under 20 ms, and with negligible packet loss. Essentially, using two 5 Mbps ADSL2 connections, a very high-quality 10 Mbps connection has been created with resilience automatically built in. Performance has been maintained at all times of day or night. Furthermore, the superb technical performance has been combined with efficient, and friendly, UK-based customer support. Very highly recommended. adding resilience, to avoid Internet connectivity being completely lost. Several few weeks ago, we were invited by Nic Elliott, Technical Director to the headquarters of Evolving Networks (shown below), so that we could find out more about the many bonded broadband solutions offered by the company. Their building, in Peterborough in the UK, houses their customer support team and advanced network monitoring and control systems. All of its bonded solutions are delivered using its own contention-free private network, allowing it to offer a broad range of bonded solutions without usage or bandwidth limits. Its focus has been solely on business customers, with an emphasis on reliability, performance and customer service. Evolving Networks offers a range of bonding solutions, using different technologies, to a diverse set of business customers. For example, one customer - an independent school - is currently bonding together seven ADSL2+ connections to deliver a combined downlink throughput in excess of 100 Mbps to support a large number of staff and students. Evolving Networks also provides bonding of FTTC fibre broadband connections, and one customer is currently bonding three FTTC connections to deliver a downlink throughput of nearly 200 Mbps. While some customers are pushing the performance envelope of broadband bonding, many customers are bonding together two ADSL lines with relatively modest throughputs (with a similar configuration to the one used in this review). At the meeting, it was agreed that the best way in which we could find out about bonded solutions was to undertake a long-term trial as a customer. Evolving Networks has been keen for us to experience its services just as its customers do. Initially, we have been trialling bonded ADSL using two connections. This will then evolve to three and four ADSL connections. We will then migrate to the bonding of FTTC fibre connections. By trialling such a broad range of solutions, we will cover the circumstances and communications needs of a wide range of organisations. 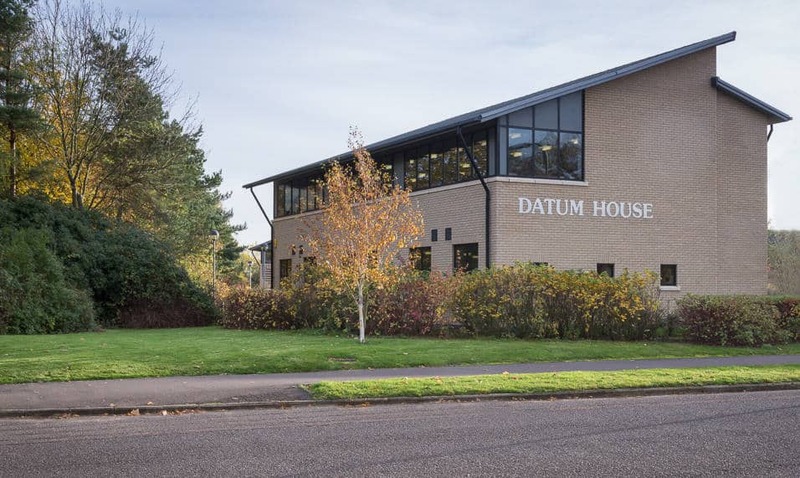 The first job for Evolving Networks was to arrange installation of two new lines at our offices in a rural Cambridgeshire village near Huntingdon. 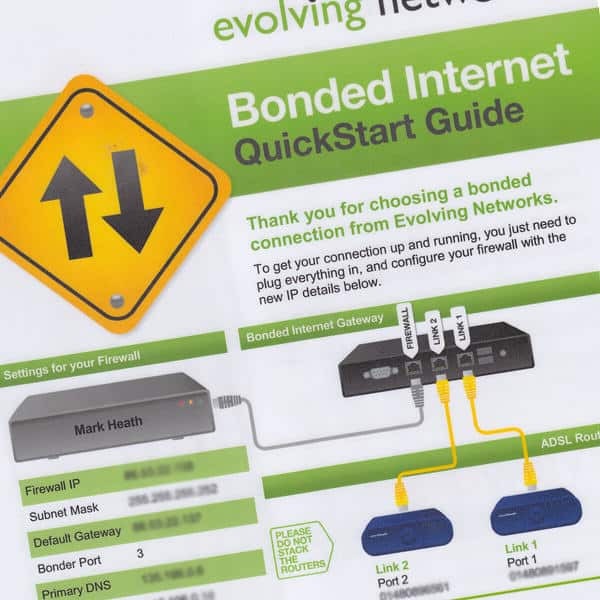 Unlike some bonding solutions where existing ADSL connections can be used, Evolving Networks installs dedicated lines to provide as much end-to-end control of its service as possible. Through this greater control, Evolving Networks is better able to the optimise the technical architecture between its network and its customers, to maximise performance and minimise delay (latency). A major advantage of Evolving Networks taking full control of the ordering and installation of broadband lines is that there is no need for customers to deal with telecom operators directly. This avoids hassle, particularly if there are installation issues or subsequent line problems. Before the installation of both lines, we were regularly updated by an enthusiastic customer support team, by email and phone, about the status of both orders with the telecom operators. Before the installation, we received (by courier) a package containing two Speedtouch modems and the Evolving Networks EV1 Bonded Internet Gateway (shown at the top of this page). In order to maximise the resilience of bonded connections, Evolving Networks prefers that ADSL or ADSL2+ lines from different telecom providers are employed, although this is decided on a case-by-case basis and choice is dependent upon the availability of Local Loop Unbundled (LLU) equipment at the exchange. Diversity of telecom suppliers prevents possible failure by one provider affecting the complete solution. In our case, one line was supplied by BT Business while the other was supplied by TalkTalk Business (using LLU). Conveniently, Evolving Networks arranged for both lines to be installed on the same day at the same time, by the same Openreach engineer. We were provided with the installation date well ahead of the actual installation. On the day, both lines were installed quickly and without incident. After visiting the local street cabinet and the exchange, the Openreach engineer installed two new master sockets. We received clear set-up instructions on a convenient, and personalised, laminated card. This contained individualised settings for our firewall router. It also contained our username and password for the online eView Live service (described below). Often, it is the little touches that make the biggest difference, and we really appreciated the fact that all the settings were on a laminated card that was resistant to coffee stains and tearing! Within minutes, everything was connected and working. Once the service was activated, we received an email and phone call from Evolving Networks Technical Support. At no stage did we feel confused or on our own in the installation process. Once the 10-day training period had passed for both lines, the technical support team at Evolving Networks got to work to optimise both lines, to extract the very highest speeds and reliability possible. Speed tests were conducted remotely and modem statistics (uploaded automatically to the network management centre) were analysed. Members of the Evolving Networks customer support team regularly interface directly with telecom operators to ensure that the most appropriate profile (for example, in terms of target signal-to-noise ratio margin and interleaving status) is used on each line. Through their analysis of performance statistics, they are also able to identify possible line faults and pass this information to operators for investigation. Luck would have it that there was a line fault on one of our lines! Although this actually delayed the start of comprehensive performance testing, it did allow the Evolving Network team to be put through its paces. Over a prolonged and painful period, Evolving Networks worked valiantly to get BT to repair the line to ensure that it delivered maximum performance. After a great deal of interaction between Evolving Networks and BT, the line was eventually repaired, initially with a change in the E-side cable between the street cabinet and the exchange, and at a later date with a ‘lift and shift’ (i.e. switching to a different ADSL line card in the exchange). We were relieved that Evolving Networks took responsibility for interfacing directly with BT, as it proved to be a prolonged and drawn-out process, and the operator did not always respond to requests in a timely manner. 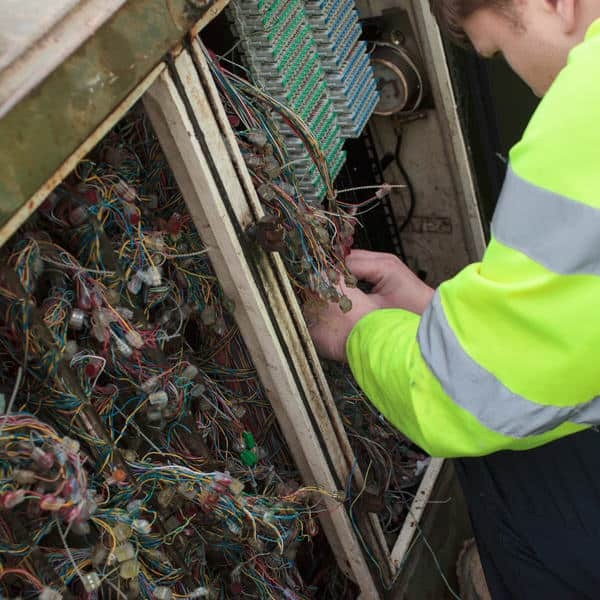 We wonder how many businesses have the time, expertise or patience to diagnose possible connection problems and ensure that these are remedied. It is, therefore, comforting that this process is part of the service from Evolving Networks, particularly as line faults can have a dramatic impact on performance. With the line fault, the problematic connection only delivered a downlink throughput of about 0.5 Mbps. After repair, the same line was able to consistently deliver over ten times this throughput. guides (for example, for installation and testing). eView Live is very useful to IT managers and business owners because it provides comprehensive status, usage and performance information about the bonding service. We think that there is enormous potential to develop eView Live further. For example, we do feel that the support information is somewhat sparse in some areas and guides are currently focused on users with Windows PCs. We understand that Evolving Networks is planning to make substantial enhancements to the eView Live system. This is great news as we think that eView Live is an important differentiator for Evolving Networks. While it is easy to focus on the improvements in throughputs from ADSL bonding, we must not forget another important benefit of a bonded ADSL solution, and that is resilience. Businesses that are dependent on a single broadband connection – whether this is ADSL, ADSL2+ or fibre broadband – are at a finite risk of losing connectivity. Now that Internet connectivity is so critical to many businesses, the loss of connectivity could be extremely inconvenient (at best) or catastrophic (at worst). By using multiple ADSL or ADSL2+ connections, the Evolving Networks solution ensures that Internet connectivity is maintained if an individual connection goes down. The system automatically detects the loss of a link and ensures that data is automatically, and immediately, directed through the working connection(s). Restoration of a line is also automatically detected so that data is sent across all working connections at all times. The only side effect from the loss of an individual link is, obviously, a reduction in total throughputs. As can be seen in the video, below, the rapid disconnection of a single line goes unnoticed, and we could not detect any service interruption when we performed many single-line disconnections to test the resilience feature. Lines are continuously monitored by Evolving Networks, and an alert about the loss of a line is displayed within seconds on the eView Live service. When we were busily testing the resilience feature, we forgot that the Evolving Networks support team are constantly monitoring the performance of individual lines and are immediately alerted in their control room about line failures. We discovered this the first time that we disconnected one of the lines. Within seconds, we received a phone call from a support engineer informing us that a line had gone down! Perhaps, these alerts could be automated in the future (for example, using email and/or SMS messaging) to complement human interaction and the eView Live system. With ADSL bonding, the proof of the pudding comes from whether the service can sustainably deliver significant improvements in uplink and downlink throughputs compared with a single ADSL connection. After such an impressive installation experience, it would have been a real shame if performance was not up to expectation. We need not have worried as the throughput performance of the Evolving Networks solution has been consistently outstanding. We believe that this is due to the fact that Evolving Networks focuses on optimising all elements of the broadband chain, including having a contention-free network, to ensure that the service delivers maximum throughputs at all times with the minimum of delay. Nothing can cause more confusion among broadband users than online speed tests, so it is essential to never rely on a single test to judge performance. There are just so many issues that can affect the reliability of a single speed test result, including the load on the speed testing server itself. It is only through a broad range of tests – when there are no other users on a network - that throughputs be realistically assessed. 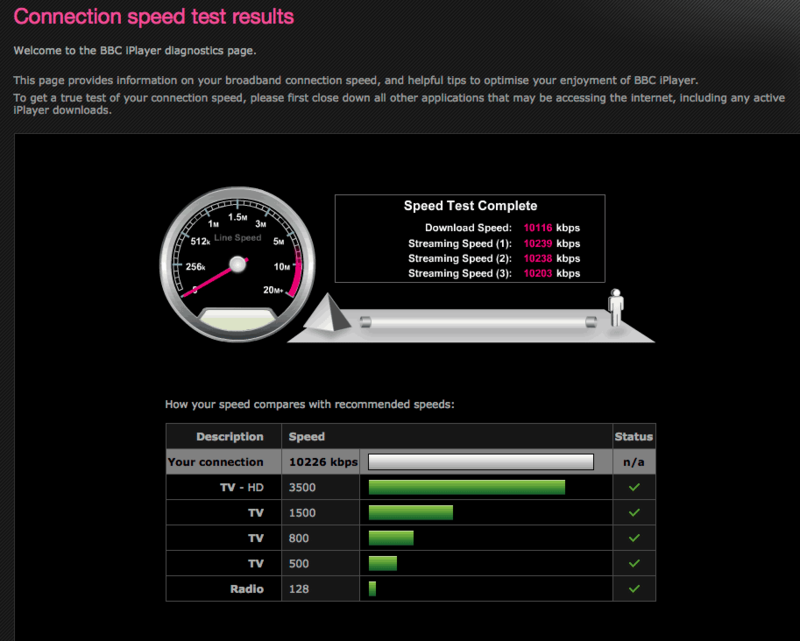 BBC iPlayer streaming speed tests. The Evolving Networks ADSL bonding service delivered downlink and uplink throughputs of greater than 10 Mbps and 1.5 Mbps, respectively, with excellent consistency. Our results indicated an absence of network contention or congestion issues at any part of the broadband chain. With any bonding service, there is inevitably a performance overhead due to the fact that the bonding process requires the transmission of some data that is used in the separation and combination process. 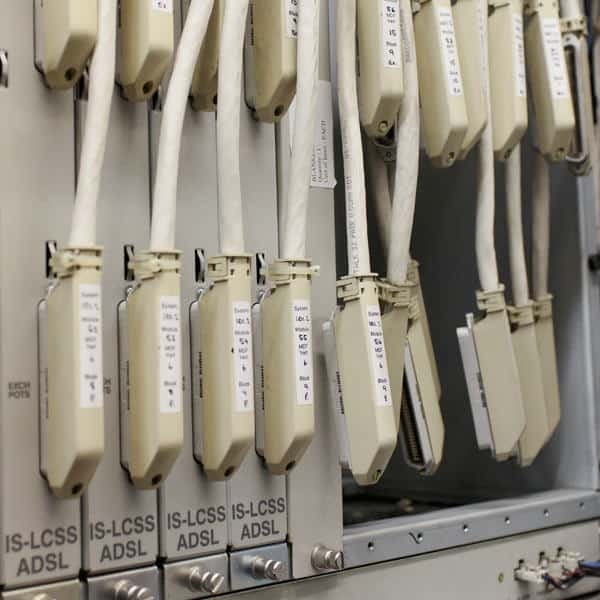 As a result, bonding services will never give 100% of the combined uplink and downlink throughputs of the individual connections utilised. Impressively, the measured performance overhead with the Evolving Networks bonded ADSL service was very small, as shown in the table, below. We found that the the combinations of the single-line throughputs were 10.86 Mbps (downlink) and 1.71 Mbps (uplink). 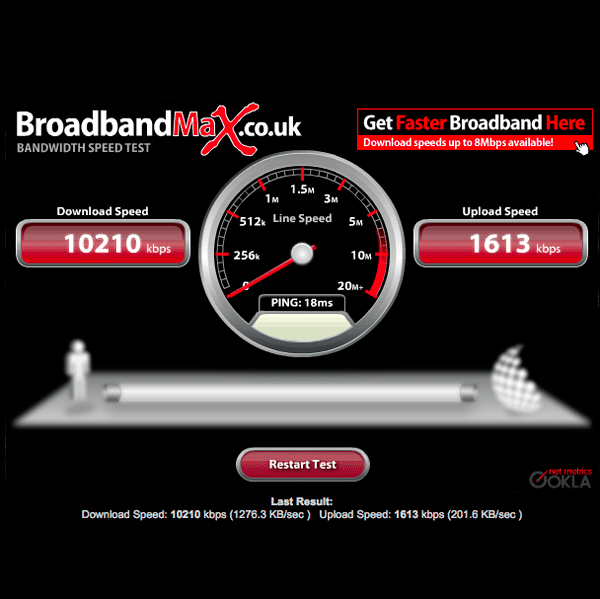 The actual throughputs of the bonded ADSL service were 10.50 Mbps (downlink) and 1.65 Mbps (uplink). In other words, the ADSL bonding service delivered throughputs of 97% (downlink) and 96% (uplink) of the combined single-line throughputs. These are outstanding results, demonstrating that customers achieve very close to the sum of the separate throughputs in practice. As mobile broadband services often demonstrate, there is much more to performance than throughputs alone, and many applications, such as Voice-over-IP (VoIP), video conferencing and to a lesser extent browsing, are susceptible to delay (latency). The lower the latency, the better that services can be delivered and the 'snappier' that services such as browsing (which may involve many DNS look-ups) will be for users. Relatively long ADSL lines can suffer from relatively high latency, made worse by the presence of interleaving. One potential concern about bonding solutions is that they potentially increase latency. However, our measurements show that the Evolving Networks ADSL bonding delivered extremely low latency, given the distance from our exchange. The average ping for the www.bbc.co.uk site was about 19 ms, as shown in the table below, which puts some fibre broadband connections to shame. interleaving being switched off on each line. Evolving Networks permitted us to connect directly to each individual ADSL line so that we could measure latency. We measured the ping on our individual lines to be about 14 ms, meaning that the additional delay from the Evolving Networks bonding was only about 4 or 5 ms.
Packet loss was also negligible. The combination of good throughputs, low latency and negligible packet loss resulted in excellent performance for all the applications we tested, which included HD video streaming, browsing and Skype VoIP. As shown in the video previously, web browsing was very responsive. All of our many test Skype test calls experienced no speech dropouts in either direction. To all intents and purposes, a high-quality 10 Mbps connection had been created without any measurable or perceived adverse performance impacts. In our next review, we will be assessing the performance of ADSL bonding using three and four ADSL connections.